Known as Mailbox 10 until 1967, the Ulba Metallurgical Plant was established in 1949. Ulba produced low-enriched uranium fuel pellets used in half of the fuel fabricated for Soviet-designed reactors. In recent years fuel pellet production has been somewhat reduced and the plant has also been converting uranium hexafluoride to powder for use at Western fuel fabrication facilities. Ulba also produces beryllium and tantalum products,  superconducting niobium-titanium alloys,  and zirconium materials. Ulba is reportedly able to process any type of uranium-containing materials, including fuel assembly by-products. During the Soviet era, Ulba produced HEU fuel for the secret Alfa submarine program and participated in the development of fuel for nuclear-powered satellites. In November 1994, approximately 600kg of weapons-grade uranium was removed from Ulba to the United States under Project Sapphire. Ulba currently has the capability to process HEU into low-enriched uranium (LEU), suitable for use in nuclear power plant fuel. In 2015, the IAEA selected the Ulba Metallurgical Plant to house the LEU Bank, which will offer countries access to low-enriched uranium should supply arrangements be disrupted. In a joint operation involving Kazatomprom and the Nuclear Threat Initiative that began in 2001, 2,900 kg of 26% enriched nuclear fuel was transferred from Aktau to Ulba to be blended down to non-weapons usable forms of uranium for use in commercial and scientific activities. The project involved several steps: Nuclear workers in Aktau loaded onto rail cars fresh HEU fuel assemblies designed, but never used, for the BN-350 reactor. The fuel assemblies were transported Ulba, where security upgrades had been installed to permit HEU storage. A blend-down line and additional security upgrades to allow HEU processing were designed, licensed, and installed at Ulba to carry out the operations. Costs of the project, approximately $2 million, were shared equally between NTI and Kazatomprom. The IAEA applied safeguards during transport, commissioning, and downblending. The facilities constructed at Ulba to blend down the BN-350 HEU fuel will remain operational and will be used in the future to eliminate other weapons-usable uranium, including the downblending of HEU fuel stored at the Institute of Nuclear Physics in Alatau. As of January 2000, 90% of the shares in the Ulba Metallurgical Plant were managed by Kazatomprom. In order to solidify its relationship with Russian companies, Kazatomprom agreed to exchange 34% percent of Ulba's shares with TVEL for shares in three Russian companies involved in the nuclear fuel cycle: Priargunskiy Mining and Chemical Association Joint Stock Company, the Novosibirsk Chemical Concentrate Plant, and the Chepetsk Mechanical Plant. [13,14,15] In response to concerns of the Russian Ministry of Atomic Energy, Ulba's bylaws were changed to allow the temporary issuance of "golden shares," which give TVEL veto powers over major policy changes. For more information on the share exchange, see the entries below from 7/6/98, 6/12/99, and 12/27/99. At a January 2006 meeting in Astana, Kazakhstan agreed to work out a plan by May 2006 to integrate its nuclear industry, including Ulba, with Russia's. William C. Potter, "The 'Sapphire' File: Lessons for International Nonproliferation Cooperation," Transition, 17 November 1995, p. 14. Boris Kuznetsov et al., "Implementation of Material Control and Accounting at the Nuclear Facilities in Kazakhstan," Partnership for Nuclear Security: United States/Former Soviet Union Program of Cooperation on Nuclear Material Protection, Control, and Accounting (Washington, DC: Department of Energy, September 1998), pp. 237-242. "O kompanii," Ulba Metallurgical Plant, www.pjsc-ulba.com. A. Yu. Gagarinski, "Can Kazakhstan Capitalize on Its Assets?" Nuclear Engineering International, December 1996, pp. 18-19. Nuclear Sites of Russia and the Newly Independent States of the Former Soviet Union, U.S. Department of Energy, September 1995, p. 50. "O Natsionalnoy atomnoy kompanii Kazatomprom," Kazatomprom, www.kazatomprom.kz. "Osnovnyye etapy razvitiya atomnoy promyshlennosti Kazakhstana," Kazatomprom, www.kazatomprom.kz. "Nuclear Nonproliferation: Status of U.S. Efforts to Improve Nuclear Material Controls in Newly Independent States," U.S. General Accounting Office, GAO/NSIAD/RCED-96-89, March 1996, p. 14. Elena Rubleva, "V Kazakhstane rossiyskaya FPG poluchila v upravleniye zavod po proisvodstvu yadernogo topliva," Finansovyye izvestiya, No. 60, 29 August 1995, p. 2. Report done for NISNP, Kazakhstan Atomic Energy Agency, 7 July 1995. Maria Golovnina, "Soviet Nuke Plant Sheds Secrets, Thinks Business," Reuters, 23 August 2006. "Kazatomprom poluchil kredit nemetskogo banka v razmere $25 mln," Interfax-Kazakhstan, 19 January 2000. "Russian-Kazakh Nuclear Fuel Cooperation," Kazakh Commercial Television, 17 December 1999, FBIS Document CEP19991220000020; "Central Asia Investment Report," Interfax Investment Report of Central Asia and Caucasus for December 20-26, 1999, Vol. II, Issue 50 (57), 27 December 1999; in "Kazatomprom Intended to Swap Equity with TVEL Concern During the First Quarter of 2000," FBIS Document FTS19991227001322. Nikolay Ivanov and Roman Zhuk, "Rossiyskiy yadernyy udar po amerikanskim interesam v Kazakhstane," Kommersant, 29 February 2000. Oleg Khe, "'Kazatomprom' prokreditovan nemetskim bankom na $25 mln.," Panorama, 3 January 2000, www.panorama.kz. "Verification of Initial LEU Inventory Under Way at Ust-Kamenogorsk Plant," NuclearFuel, 31 July 1995, p. 6. "Department of Energy Nuclear Material Physical Protection Program in the Republic of Kazakhstan," Partnership for Nuclear Security: United States/Former Soviet Union Program of Cooperation on Nuclear Material Protection, Control, and Accounting (Washington, DC: Department of Energy, September 1998), pp. 243-247. Tariq Rauf "From 'Atoms for Peace' to an IAEA Nuclear Fuel Bank," Arms Control Today, October 2015, www.armscontrol.org. "IAEA Low Enriched Uranium Bank" International Atomic Energy Association, Fact Sheet, March 2017, www.iaea.org. On 21 November 1994, 581kg (1,278 pounds) of HEU was transferred from the Ulba Metallurgical Plant 20 miles outside of the northern Kazakhstani city of Ust-Kamenogorsk to the Y-12 plant at the Oak Ridge National Laboratory in Tennessee, in a highly secret project code-named "Sapphire." The project was initiated by President Nursultan Nazarbayev with the full knowledge of Russia, according to Kazakhstani Deputy Prime Minister Vitaliy Mette, in order to prevent the possibility of diversion by terrorists, or by any of the so-called nuclear threshold states near Kazakhstan. 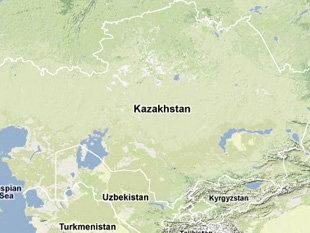 Government officials claimed that apart from the plutonium in missiles remaining on its territory, Kazakhstan no longer has any significant nuclear stockpiles. William H. Courtney, the US Ambassador to Kazakhstan, led the secret negotiations in cooperation with the Kazakhstani government and the US Departments of Defense and Energy. The uranium, reportedly left over from the Soviet Union's secret Alfa submarine program, had been stored at Ulba in unsecured and unsafeguarded facilities, without electronic means of accounting. Instead, quantities were simply recorded by hand into books. Experts estimate the uranium was sufficient to make 20-25 nuclear bombs, though it was said a "skilled bomb-maker" could have produced as many as 36. One estimate said the material was sufficient for up to 50 bombs. Kazakhstani experts maintained that only about 5 percent of the HEU was pure enough to be used for weapons, while the rest would have required further processing. Thirty-one technicians, led by Oak Ridge scientist Alex Riedy, went to Kazakhstan to repackage the uranium into 1,300 steel canisters for shipment by two C-5 transport planes from Kazakhstan to the United States. Empty canisters marked with Tehran addresses were reportedly found in the room next to the one where the uranium was stored. At the time, Vitaliy Nasonov, then deputy chief of the Russian Ministry of Atomic Energy Information Department, indicated that the amount of HEU transferred to the United States from Kazakhstan could only have been about 167kg of tablets of uranium-235-beryllium alloy, and 27.4kg of uranium-235 dioxide powder—which comes to a total of only 194.4kg. Possible military uses for the Kazakhstani uranium were dismissed, as Russian experts believe that only Russia and the United States are capable of producing a bomb from uranium-235 alloyed with beryllium. The 27.4kg of uranium-235 dioxide could only be converted into weapon-grade uranium after costly processing. Nasonov's claims are contradicted by both Kazakhstan and U.S. reports. For a U.S. report on the material see "Sapphire Sampling Plan," Prepared by Oak Ridge Y-12 Plant (December 1994). William C. Potter, "The 'Sapphire' File: Lessons for International Nonproliferation Cooperation," Transition, 17 November 1995, pp. 14-19. R. Jeffrey Smith, "Kazakhstan Site Had Lax Security," Washington Post, 24 November 1994, p. A52. "Kazakhstan Says Nuclear Deal Boosts Disarmament," Reuters, 24 November 1994. Jim Adams, "US-Kazakhstan Uranium Deal May Be One of a Kind," Reuters, 24 November 1994. "Nuclear Bomb Fuel (sic) Cache Found in Kazakhstan," Reuters, 22 November 1994. Andrey Baganov, "Kazakhstan obogashchaet USA uranom," Nezavisimaya gazeta, 25 November 1994. Sergey Kozlov, "Uranovaya sdelka okazalas vesma vygodnoy," Nezavisimaya gazeta, 26 November 1994. Vladimir Nadein, "Besprimernaya uranovaya sdelka Kazakhstana i USA - kommertsiya ili POLITIKA?" Izvestiya, 25 November 1994. "Project Sapphire," Defense Threat Reduction Agency, www.dtra.mil. "USEC Slated to Sell Sapphire Material Blended to 4% LEER, for DOE Next Summer," Nuclear Fuel, 19 July 1996, p. 4. "US Version of Uranium Deal with Almaty Questioned," Kommersant-Daily, 25 November 1994, FBIS-SOV-94-228, p. 4. The first shipment of several "extremely large deliveries" of beryllium from the Ulba Metallurgical Plant to Chinese companies has been completed, according to an article on Kazatomprom's website. Beryllium is controlled as a dual-use item, because of its use in electronics and instrument-making, and possible use in nuclear weapons and reactors. The article did not specify what Chinese companies the beryllium was delivered to, how much or what type of beryllium was supplied, or what the end use of the supplied material would be. Ulba is the second largest producer of beryllium in the world, and production increased by 16% in 2002. New beryllium alloys are currently being developed in conjunction with US firms. A project to upgrade the material control and accounting system at Ulba has been underway since 14 April 2000. The project, with a total budget of €2 million (approximately $2 million as of July 2002) is funded by the EU TACIS program, and is expected to end by December 2002. The newly upgraded system will track and account for nuclear materials in uranium-containing liquids at every stage of the production cycle. With such a capability the system will accomplish three objectives: prevent the possible theft of materials, obtain full information about the quantity of materials within the production cycle, and provide credible information to the International Atomic Energy Agency. This project has been implemented under the framework of the nuclear safety agreement signed by the European Atomic Energy Community and the Republic of Kazakhstan in July 1999. On 1 July 2002, US Department of Energy (DOE) Secretary Spencer Abraham announced the second nonproliferation project at the Ulba Metallurgical Plant. The new project, part of the Russian Transition Initiatives program, run by the National Nuclear Security Administration (NNSA), will expand and upgrade Ulba's capacity for the production of copper beryllium master alloy, which has commercial applications. The plant will earn an estimated $10 million per year from the project. At least 150 jobs are expected to be sustained for the next 8-10 years. Los Alamos National Laboratory will provide technical assistance and NNSA will provide funding and expertise. Brush Wellman, Inc. of Cleveland, Ohio and RWE Nukem, Inc. of Danbury, Connecticut will invest $4 million in the Ulba project. Ulba has committed over $4.5 million, and the NNSA will contribute at least $1.5 million. On 30 January 2002, US Department of Energy (DOE) Secretary Spencer Abraham announced a new nonproliferation project with Kazakhstan. Under the project, two US companies, Global Nuclear Fuel-Americas (GNF) and RWE Nukem, and Brookhaven National Laboratory will assist the Ulba Metallurgical Plant in Kazakhstan to use its advanced solvent extraction technology to recover low-enriched uranium from uranium concentrates. According to Abraham, the project will immediately create 50 new civilian jobs for former nuclear weapons scientists in Kazakhstan. In the coming years, the project is expected to employ hundreds of former nuclear weapons workers. DOE's National Nuclear Security Administration (NNSA) has committed $1.2 million in IPP funds for joint work between Ulba and Brookhaven National Laboratory to design and install this technology. The recovered uranium will be available for commercial use in boiling water reactors. The US industry partners have matched NNSA's contribution. According to Vitaliy Khadeyev, general director of Ulba, the plant has entered into a commercial venture, Joint Ukraine-Russia-Kazakhstan Fuel Enterprise, Ltd., to produce fuel pellets for Ukraine's nuclear power plants. Ukraine and Kazakhstan have both signed the agreement, which is yet to be signed by Russia. This contradicts earlier reports indicating that all the parties had signed the agreement (see the 7/5/2001 entry, below). Ukraine will supply uranium and zirconium, Kazakhstan will produce uranium fuel pellets, and Russia will use the pellets and zirconium to make fuel assemblies. According to Khadeyev, Ukraine will benefit from participating in the joint venture by using its own uranium and zirconium and by participating in the development of nuclear fuel for its power plants. Russia will preserve its uranium export market, and Kazakhstan will have guaranteed orders for its uranium pellets. On 5 July 2001, Kommersant reported that Kazakhstan's Kazatomprom, Russia's TVEL, and Ukraine's Energoatom signed an agreement to establish a joint venture to produce nuclear fuel elements for Ukrainian nuclear power plants. The idea was first raised as early as 1996 (see 12/27/96 entry), and since then has been under discussion (see 7/12/2000 entry). In 1996, several companies including TVEL, Westinghouse, Totall-Framatom, Siemens, and ABB bid on the right to participate in the project. TVEL won the tender but was not able to finance the project at that time. Under the agreement, the three sides must each contribute 33.3% of $450,000 as start-up capital within 30 days. "Ukraine to take Part in Russo-Kazakh Nuclear Fuel Joint Venture," Interfax-Kazakhstan, 12 July 2000, FBIS Document CEP200007130000192. "Russian-Kazakh Nuclear Fuel Cooperation," Kazakh Commercial Television in Russian, 17 December 1999, FBIS Document CEP19991220000020. "Central Asia Investment Report," Interfax Investment Report of Central Asia and Caucasus for 20-26 December 1999, Vol. II, Issue 50 (57), 27 December 1999; in "Kazatomprom Intended to Swap Equity with TVEL Concern During the First Quarter of 2000," FBIS Document FTS19991227001322. Nikolai Ivanov and Roman Zhuk, "Rossiyskiy yadernyy udar po amerikanskim interesam v Kazakhstane," Kommersant, 29 February 2000. Kazatomprom plans to set up its own production of hydrofluoric acid, which is used for the production of uranium, tantalum, and beryllium at the Ulba Metallurgical Plant. For more information, please see the 5/19/00 entry in the mining developments section of the database. At a 19 January 2000 press conference, Kazatomprom President Mukhtar Dzhakishev announced that Kazatomprom had received a $25 million loan from Westdeutsche Landesbank Girozentrale of Germany. The money will augment the company's working capital, as well as fund investments in uranium mining, the opening of two new mines, and the modernization of the Ulba Metallurgical Plant. "Kazakh Metal Plant Head Comments on Accords with US GE," Ekspress-K, 6 January 2000, FBIS Document CEP20000117000018. "Kazatomprom to Supply $120 million in beryllium products to Brush Wellman," Interfax-CIS Daily News Briefs Volume II, Issue 172 (193), 11 September 2000. Kazakh Commercial Television, 17 December 1999; in "Russian-Kazakh Nuclear Fuel Cooperation," FBIS Document CEP19991220000020. Interfax Investment Report of Central Asia and Caucasus for 20-26 December 1999, Vol. II, Issue 50 (57), 27 December 1999; in "Kazatomprom Intended to Swap Equity with TVEL Concern During the First Quarter of 2000," FBIS Document FTS19991227001322. In December 1999 Kazatomprom signed agreements with Brush Wellman and General Electric regarding international sales of uranium and beryllium. By 2002 Kazatomprom intends to resume beryllium production, after refurbishing the country's beryllium production facilities. Kazakhstani beryllium production ceased in 1992. In the beginning of November 1999, Ulba restarted tantalum processing. It plans to import raw tantalum and export 10 MT of processed tantalum to the West each month. With Resolution No. 1474, on 13 August 1999, the Ukrainian Cabinet of Ministers approved a draft agreement on the creation of a Ukrainian-Russian-Kazakhstani joint venture VVER fuel plant in Ukraine. A 1996 Ukrainian tender commission awarded the construction of the nuclear fuel plant to the Russian company TVEL. For more information on joint venture efforts, see the 4/97 entry. On 12 June 1999 Russian First Deputy Prime Minister Nikolay Aksenenko and Kazatomprom Chief Mukhtar Dzhakishev reached an agreement to exchange shares between Ulba Metallurgical Plant and TVEL. Dzhakishev indicated that talks on the proposed exchange had been in progress for a year (see entry for 7/6/98). TVEL had asked for 51% of Ulba, but Dzhakishev was opposed to giving the Russian enterprise majority ownership. The two sides have yet to work out the exact number of shares to be exchanged and which Russian enterprises will be involved in the deal. According to Dzhakishev, Russia is interested in preserving the integrated fuel cycle that existed during the Soviet era and retaining Ulba as a source of fuel pellets. In Moscow on 14 January 1999, Mukhtar Dzhakishev, President of Kazatomprom, signed a contract with the Russian nuclear fuel company TVEL. The contract is intended to ensure orders for the Ulba Metallurgical Plant. The talks also ensure further cooperation between Russia and Kazakhstan. Dzhakishev said in an interview that Kazatomprom's goal is to make Kazakhstan a world leader in the mining and production of uranium by the year 2005. Kazatomprom predicts that the sale of world stockpiles of uranium will continue until 2010, with a peak in sales occurring in 2001. This will be followed by a decline, and prices will accordingly begin to rise. While the rest of the world reduces its production of uranium, Kazakhstan will increase the scope of its mining by four to five times. Other plans include the sale of more highly enriched uranium products, the manufacture of new types of fuel for nuclear reactors, and the joint manufacture of fuel assemblies with Russian ventures. Kazatomprom is also moving toward privatization, but has not yet been privatized due to its current financial difficulties. To make Kazatomprom an attractive investment, talks are being conducted to get credit from western banks, and there are now several proposals for credit in amounts from $25 to $70 million. Once received, the credit is to be used in the creation of new jobs, new mines, and new production at the Ulba Metallurgical Plant. Kazatomprom expects to turn a profit this year after a long period of operating at a loss. On 6 July 1998, the Russian government approved the draft of an agreement with Kazakhstan on the integration of nuclear fuel cycle facilities. Under the draft agreement, the two countries would guarantee joint financial and technical projects directed at the development of fuel cycle facilities for nuclear power plants in both countries. In particular, Russia and Kazakhstan would establish long-term cooperation in nuclear fuel production through the joint contributions of the Russian firm TVEL and the Kazakhstani state-owned company Kazatomprom to the charter capital of OAO Ulba Metallurgical Plant. Both states similarly plan to cooperate in the establishment and operation of a joint venture for uranium mining. In December 1997, a scientific conference on nuclear engineering development issues was held at the Ulba Metallurgical Plant. Leading Russian and Kazakstani nuclear experts attended the conference to discuss the prospects for the production of fuel used at nuclear power plants. Vitaliy Konovalov, the president of the Russian company TVEL, noted that nuclear power consumption in Kazakhstan is projected to increase, on average, by 50 to 300 percent over the next fifty years. He argued that South Kazakhstan will require nuclear power plants. During the conference, some advised that Russia and Kazakhstan should cooperate in the world market for equipment and fuel for nuclear power plants. The participants of the conference discussed the advantages of nuclear power for Kazakhstan, supporting their position by citing the negative effect of fossil fuel power plants on the environment and the strict safety system at existing reactors in Kazakhstan. Andrey Kratyenko, "Is hell in store for us without the atom?" Almaty Express, 18 December 1997, p. 2; in "Kazakhstan Needs Power to Avoid Ecological Disaster," FBIS-SOV-97-355. Viktoriya Shevchenko, "Odnoimyonnye prityagivayutsya. K yadru v Ust-Kamenogorskye," Kazakhstanskaya pravda, no. 265, 19 December 1997, p. 1. Viktoriya Shevchenko, "Alternativy atomnoy energetike v Kazakhstane net," Kazakhstanskaya pravda, no. 2, 6 January 1998, p. 3. The United States Department of Energy (DOE) has provided nondestructive assay techniques and systems to upgrade materials protection, control, and accounting (MPC&A) at the Ulba Metallurgical Plant. The nuclear MPC&A enhancement program for Ulba is essentially complete, though some follow-up is expected to ensure a smooth transition to self-sufficiency. The site still requires calibration materials, which will be provided by New Brunswick Laboratory after Kazakhstani regulatory approval. In July 1997, 80 containers with highly toxic beryllium dioxide were stolen from the Ulba Metallurgical plant's storage facilities. According to the Office of Environmental Control, after being emptied (the beryllium dioxide was dumped right onto the ground), the containers were sold at a local market. The Maslikhat (local government) was the only government body that was notified about the incident. According to the article, Ulba authorities did not report the incident to the Emergency Situations Committee or to the Office of Environmental Control, thus violating the Law on Emergency Situations. As of 5 July 1997, only 28 out of 80 stolen containers had been recovered. Oleg Kilnitskiy, "Joint Venture to Establish Nuclear Fuel Processing Company," Intelnews, 28 April 1997, FBIS-SOV-97-118. "Ukraine, Russia, Kazakhstan to Build Nuclear Fuel Plant," The Russian, April 1997, p. 7. In a few months a trilateral agreement between Kazakhstan, Russia, and Ukraine will be signed. The agreement will concern the creation of fuel fabrication facilities, which will supply fuel to Ukrainian nuclear power plants. Kazakhstan will be represented by Ulba Metallurgical Plant, which produces fuel pellets; Ukraine will be represented by Eastern Mining and Conversion Combine and the Pridniproviye Chemical Plant; and Russia will be represented by TVEL. Building the fuel rod assembly line on Russian territory would cost about $50 million. It is assumed that the parties would have equal shares in the joint venture's capital. In September 1996, a training course was held in Sweden on practical material accounting and safeguards techniques for Ulba personnel. The course was arranged by ABB Atom, Safetech Engineering, and SKI (the Swedish Nuclear Power Inspectorate.) This course was the third support activity sponsored by ABB Atom in the safeguards field. Previous courses were designed to create an accounting system for uranium at the Ulba plant and a safeguards manual. The twelve participants in the course learned about material accountancy and safeguards activities at ABB Atom. The training included both theoretical and practical lessons. The Ulba Metallurgical plant has received grants of more than $4 million from the International Science and Technology Center (ISTC) for the conversion of nuclear industry. The grants were designated to develop technologies for the production of magnets made of rare-earth elements and for making super-conductive coils. David Guibnik, ITSC project manager, said that Kazakhstani enterprises under conversion have prepared 13 projects for ITSC funding, including the production of the following materials: lithium carbonate and lithium hydroxide (capacity 3,000 MT/year), magnesium oxide (1,500 MT/year), and tantalum-containing materials(200 MT/year of tantalum). The ISTC board has approved 44 new projects, raising the financing of all ISTC projects to $121 million, which makes its possible for some 15,400 scientists from Russia, Kazakhstan, Belarus, Armenia, Georgia, and Kyrgyzstan to participate in civilian projects. It was reported that an IAEA commission completed material control and accounting (MC&A) and physical protection verification measures at the Ulba plant. It was reported that Kazakhstani Prime Minister Akezhan Kazhegeldin initiated an audit of the financial activity of the Kazakhstani National Joint Stock Atomic Power Engineering and Industry Company (KATEP). The reason for the audit was the filing of criminal charges against officials of the joint stock company Ulba (the company manages the Ulba Metallurgical Plant), which is a member of the joint stock company KATEP. KATEP was granted the right to possess, use, and manage the state's package of shares at Ulba. In connection with the audit, the press source mentioned the voluntary resignation of former deputy prime minister Vitaliy Mette, Ulba's former manager, and the firing of the Akim of the Eastern Kazakhstan oblast, Leonid Desyatnik, due to criminal charges filed against him. Bhavna Dave, "Alarming Number of Uranium Thefts in Kazakhstan," OMRI Daily Digest, 9 April 1996, Vol. 2, No. 70, pp. 3-4. Spaseniye, No. 7-8, April 1996, p. 1. "Theft of Nuke Materials 'Common' in Kazakhstan," Post-Soviet Nuclear and Defense Monitor, 9 April 1996, p. 4. "Pri vybore reaktora my budem rukovodstvovatsya dvumya printsipami: bezopasnostyu i ekonomichnostyu," Kazakhstanskaya pravda, 15 May 1996, p. 7. The Kazakhstan government decided to transfer the rights of ownership, use, and management of the Ulba state holding company to the Russian financial group Interros. The transfer was concluded by selling an undisclosed amount of shares in the corporation according to the government resolution "On Measures for the Financial Improvement of the Government Holding Company 'Ulba.'" Two reasons have been cited for the move: 1) the need for better financing of the company and 2) the wish to develop the Kazakhstani nuclear industry jointly with the Russian Federation. Kazakhstani Vice-Prime Minister stated in an interview to Interfax that Ulba is joining in a unified technological cycle of nuclear fuel production jointly with a Russian enterprise. Since mid-1993, the US DOE has been spending about $5 million/year under the CTR program to assist in upgrading security at the Ust-Kamenogorsk (Ulba) facility and to help take an materials inventory. Because the UO2 fuel pellets produced in Kazakhstan generally, and at Ust-Kamenogorsk specifically, make use of UF6, which is enriched in Russia, their existence represents a potential proliferation risk. "Verification of Initial LEU Inventory Under Way at Ust-Kamenogorsk," Nuclear Fuel, 31 July 1995, p. 5. William C. Potter, "An Overview of the Nuclear Potential of Select Non-Russian Soviet Successor States," unpublished paper presented to the Carnegie Endowment for International Peace, 20 August 1992, p. 3. Zhenis Sadykov, chairman of the Nevada-Semipalatinsk Problem-Solving Scientific Committee, stated that nuclear waste from the Ulba uranium plant in Ust-Kamenogorsk has been stored in the center of the city. He claimed that two artificial radioactive lakes have arisen in which children bathe and from which local inhabitants drink. He also indicated that a waste burial site in Kurchatov (Semipalatinsk) has already been prepared, but not advertised. Responding to a 24 October 1996 Washington Times report that the amount of Kazakhstani highly enriched uranium (HEU) was 120 pounds (54.5 kg) short of the initially declared weight of 1,278 lb. (581 kg), Kazakhstani Ambassador to the United States Bolat Nurgaliyev stated that no material was diverted before the United States shipped away the HEU purchased from Kazakhstan. He underscored that the Kazakhstani HEU weight declaration was an approximation subject to verification of the United States. Nurgaliyev also described that in 1992, Iranian representatives made contact with the Ust-Kamenogorsk facility (where the HEU was stored), "but what they were trying to buy was not HEU." He added that there was "absolutely no indication Iran was interested in HEU." Kazakhstan renounced its possession of nuclear weapons in 1993, signed the NPT, shipped all warheads to Russia and signed the HEU deal with the United States. Nurgaliyev said that the United States compensated Kazakhstan for the HEU, providing between $20 million and $30 million in cash and goods in kind. Rowan Scarborough, "Tale told of how Iran nearly got nuke gear," Washington Times, 2 November 1996, p. 3. "So storony Kazakhstana 'nedovesa' yadernykh materialov net," Kazakhstanskaya pravda, 31 October 1996. The Washington Times reported that a 120-pound (54.5 kg) shortage has been discovered in the process of blending down the Kazakhstani HEU shipped to the United States on 11/21/94 under Project Sapphire. The initially declared amount of the HEU was 1,278 lb. (581 kg). A US Department of Energy (DOE) spokesman commented that there was difficulty in obtaining precise measurements of the HEU contained among 2.4 tons of discarded metals, oxides, and uranium-beryllium alloys shipped from Kazakhstan. DOE issued a statement that said, "both governments clearly understood that the quantities of highly enriched uranium were imprecise. The point was to secure the material first and perform precise characterization of the material later." In response to a question of whether it was possible that the HEU could have been diverted between the time the HEU was inspected in Kazakhstan and the time the material was put on US planes, Assistant Secretary of Defense Kenneth Bacon said that there was adequate security during all parts of the shipment of the Kazakhstani HEU. He added that there was no indication that any of the Kazakhstani HEU may have been ended up in Iran. The DOE's statement specifically denied that any of the material is missing or stolen. According to a 30 August 1996 memo of the US Oak Ridge National Laboratory, the estimated cost for Project Sapphire "will be approximately $3.5 million inclusive of the first year of storage costs." On 27 October 1996, the Iranian Atomic Energy Agency issued a statement that Iran reserves the right to file a complaint to the International Atomic Energy Agency regarding some "US officials' claim" that the missing portion of the Kazakhstani HEU shipped to the United States under Project Sapphire could have been stolen by Iran. Rowan Scarborough, "Kazakh Uranium Shipment Is Shy Enough for Two Bombs," Washington Times, 24 October 1996, p. 3. Kenneth M. Bacon, US Department of Defense News Briefing, 24 October 1996, www.dtic.mil. "Sapphire HEU Is Less Than DOE First Claimed, Government Admits," Nucleonics Week, 7 November 1996, p. 15. "Iran's Rejection of the New United States Claim," Tehran Voice of the Islamic Republic of Iran, 28 October 1996; in "Iran: Commentary Views Disagreement with U.S. on Kazak Uranium," FBIS-TAC-96-010. Izvestiya reported that Russia's Minatom could only account for one-third of the HEU that the United States removed under agreement from Kazakhstan's Ulba fuel reprocessing facility in Ust-Kamenogorsk. Minatom believed that only 200 kg of HEU were at the facility; however the United States airlifted 600 kg back to the United States. The uranium that was transferred from the Ulba Metallurgical plant in Ust-Kamenogorsk to the Oakridge Lab in the United States in Project Sapphire had been in unsecured and unsafeguarded facilities, without electronic means of accounting. The amounts of radioactive materials present were physically recorded by hand into books. Reportedly, this was not an isolated case of inadequate MC&A in Kazakhstan.